Hey guys, when I originally wrote this article in 2011 I didn’t realise how popular it would become! On average we have 500+ views a day, just on this post alone. Thanks to those who have shared their experiences. They say that a problem shared is a problem solved. So please do share any advice or any secrets to how you battled (and hopefully won) your fight with Milia. The funniest thing is that in 2013 my daughter was born with Milia. I’d never personally experienced it only treated clients. I had to fight hard not to panic. It must have been baby brain or something because I forgot everything I knew. I actually had to come back to the site and re-read what I’d written myself just to calm myself down. People kept commenting on the “small spots on her face” which became really irritating very quickly. As a new parent you become very defensive over your baby and any criticism. So I found myself having to educate alot of strangers and all those aunts and uncles who wanted to offer words of advice on how to treat them. Some of the advice I heard was quite shocking, especially considering we were talking about a new born baby! Luckily after using pure Olive Oil and nothing else on her skin the little spots disappeared by the time she was 2 months old. They usually say Milia disappears on newborns after a few days so when Tallulah’s didn’t show any signs of fading away it was hard not to become worried. The main thing I had to remind myself was not to clog her pores so I avoided using baby powder on her face and I definitely didn’t squeeze them as some suggested! Anyway.. Good luck on your journey to finding a solution that works for you. Read the article below and please do leave feedback either asking for advice or offering some insight on your own experiences. For some people, Milia can be the bane of their lives. People often confuse them for spots and can fall prey to some beauty therapists (actually i’ll just call them people who do facials as I don’t want to tarnish the reputation of truly qualified therapists *wink* ) who damage the client’s skin by trying to “extract” these sometimes very painful bumps. Fixing those little white bumps starts with a small dose of education and ends with a very big dose of prevention. After taking all the necessary precautions (which we will be talking about) your little bumps should give way to clearer skin. 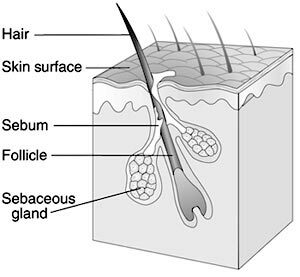 An individual milium (the singular of milia) is formed at the base of a hair follicle or sweat gland. Milia are benign, white cysts. They are quite common, and can be found on infants, children and adults. These cysts are filled with keratin (NOT PUS) and they often appear around the eyes and on the cheeks and nose. 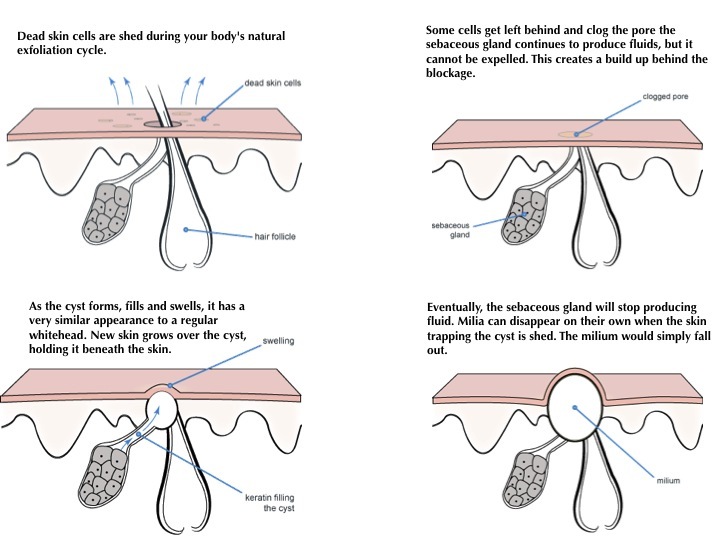 Milia occurs when surface-level skin cells are not sloughed off and so the cells clog the skin, leading to these cysts. Milia seeds are white or yellowish bumps and are also sometimes called oil seeds, these are usually small and hard. Sometimes, if a milia seed is new, it can be soft, and appear as though it is a pimple without an opening. Thankfully, you can have milia removed by a dermatologist. You can also follow a skincare regime at home that will decrease the presence of milia. Exfoliating the skin, or removing the dead skin cells from your skin with an abrasive product or chemical, is beneficial. But brutally scrubbing your face with soaps and chemicals too frequently may actually create milia! To avoid this, remember that gentle exfoliation helps prevent excess dead skin cell build-up that could clog your pores and cause whiteheads, not milia. 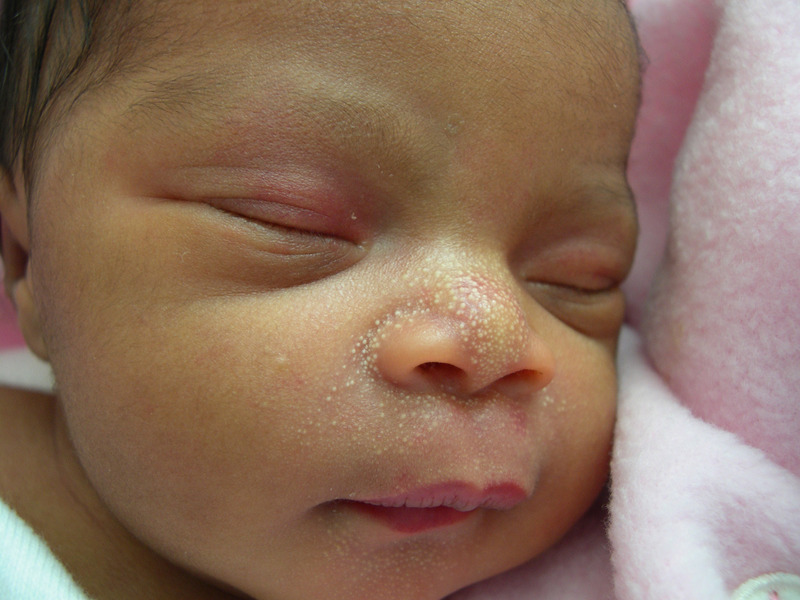 Primary milia are formed directly from sloughed-off skin and are very small, fluid-filled cysts, usually found on the faces of infants and adults. Secondary milia are also tiny cysts and look similar, but these develop after something clogs the ducts leading to the skin surface, such as after an injury, burn, or blistering of the skin. 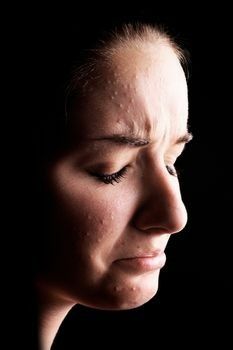 Just because you have little white bumps on your face does not necessarily mean that you have acne. Acne and Milia are very different skin conditions. Comedones or whiteheads (aka acne) are excess fats and wastes that are trapped in a hair follicle and so they clog up the pores. So basically the difference between Milia and Acne, Spots, Zits or what ever you want to call them is quite simply that Milia are proteins trapped within the skin, while Comedones are fats and skin debris trapped within the pore. They may both appear to be little bumps under the skin but they’re both very different things. This gentle exfoliation makes eventual removal of the milia easier because the skin layer around the milia becomes thinner, with frequent, yet gentle exfoliation. In short; Exfoliate your skin to prevent milia, not to cure them. When you were a baby, you were probably covered with milia that disappeared after a few days. Or, you may have inherited milia from your parents. On the other hand, you may develop milia after excessive exposure to the sun. The reasons for developing milia after sun exposure are debatable. According to some studies, the active ingredients such as sunscreens like Parsol 1789 may cause sun allergies and later lead to a milia breakout. Other studies blame the sun itself for “damaging” the skin and thus causing little white bumps. Some people experience milia around the mouth and this could be the result of fluoride irritation from toothpaste. The best way to prevent milia is to avoid treating your skin with excessively harsh chemicals and to limit sun exposure. Use a day cream which contains a good SPF factor, try to protect yourself with a minimum of a factor 25 if you suffer from Milia. (We’ll look into Sun creams another time). Wash your face with a deep cleanser. A deep cleanser is one that is made for oily or blemish-prone skin. It will destroy dirt and environmental elements that would otherwise clog your sweat ducts and can contribute to milia seeds. (Try Germaine de Cappuccini – Pure T range or speak to your local “qualified” beauty therapist for more advice). Exfoliate your skin. Regular exfoliation encourages skin cell generation, helping new skin cells to replace the cells affected by milia faster as well as buff and polish the healthy skin left behind. Exfoliation also helps to prevent new milia from forming. Use a gentle mask on your face. This can help to draw any impurities out of your skin, thus helping to prevent further clogging of your sweat ducts down the road. Get chemical peels. During a peel, acids are applied to your skin to burn away the top layers. Once your skin heals, it will appear younger and smoother, and your milia will be less noticeable. A series of peels are often needed to effectively get rid of milia. When brushing your teeth, try to avoid leaving the froth around your mouth too long. This limits possible fluoride irritation to the skin. Use a sunscreen with as very few amount of ingredients as possible. Extraneous ingredients like fragrances may irritate your skin. Additionally, purchase sunscreens that offer physical sun blockage that contain active ingredients like titanium oxide or zinc oxide. The key to getting rid of milia is realizing that they have no escape route, those little bumps are trapped under the skin. So, to get them out, you’ll need to have a professional like a dermatologist or aesthetician to extract them. Do not try to extract the milia yourself!! You need to ensure that your milia are not symptoms of some underlying disease or illness. Also, if you extract the milia yourself, you may have trouble completely pulling out the cysts, as the removable process may prove too painful. Now, you have no reason to walk around with little bumps on your face. If you still think you do, please consider the possibility that you’re just telling yourself little white bumpy lies. Can you please tell me how you got rid of them as I really want rid of mine. Go to a skin clinic and ask for milia removal. i have one right in the corner of my left eye. It’s been there for more than a year. I also had milia around my eye in the soft skin, and the Oil Cleansing Method helped take care of those more or less. Try it? Extra Virgin Olive oil and Castor oil – though I’ve long since stopped using caster oil as it gives me breakouts, but I love the Olive oil. Coconut oil is also marvelous, as well as Jojoba and now also Argan oil. I mix in a drop of two of various essential oils (tea tree, Peppermint, Lemongrass, Rose, Sandalwood etc etc) to change the smell and so far I have great results with this and also a lot less blackheads. Thanks Lunanoir! I’m sure your response will help alot of people who are dealing with the same issue. I love the use of oils and essential oils. Castor oil is quite heavy, it’s very good for stimulating the skin/scalp for hair growth so I can imagine why it would give you breakouts. 🙂 – I’d love to hear any more feedback over time to see if it’s still working for you. this was so so helpful i think these are what i have- small hard white cyst like lumps, that I get on my cheeks, about an inch away from either side of my mouth. I think I have these because i have polycystic ovaries. Ive gone off the pill recently- and these little lumps have returned, that did go away once i went on the pill a while ago. Thanks so much for the feedback! Polycystic ovaries can cause havoc with our skin. But as annoying as they may be, thank goodness they’re harmless. When you know what they are, they’re that lil bit less annoying, and you don’t worry yourself about trying to squeeze them in the bathroom mirror! I bet that’s how I got mine(PCOS is a bugger). I had big ones around my eyes for a few years and they always bothered me. I went in today to ask the dermatologist about them and within about 10 minutes he had them removed. It really didn’t hurt (just a poking irritation like a needle but nothing painful). I was curious about the procedure since I couldn’t see it when they were doing it so I googled it and found this page. Very informative. Thank you. This is a wonderful page. Well written. Excellent information, thank you very much. I have one in the corner of my eye and thought it was a cyst, or possibly something worse. This information put me at ease and I’ve scheduled and appointment with my doctor to have it removed properly. I am having white hard and small bumps appearing all over my body.They are on my inner thights, the underside of my upper arms, and I just noticed one on my hand. I live in a hot climate. Sweat and sun. Thank you so much for any suggestions, since I’m not dealing with just my face. Hey Lala, so sorry that sounds really irritating to say the least. Do they itch or are they just visually annoying? I can’t advise too much without actually seeing them, if you’d like, you could send me an email and i’ll have a look at them for you. Lola@mysacredbeauty.com – Sounds like they’re affecting areas where your sweat alot or have alot of sebum/oil production so they could also be closed comedones, do they come and go or are they always present? I have what she indicates, have all my life. Typically, as my doctor has mentioned these are caused by keratosis pilaris, fancy way of saying that the little pearls of keratin aren’t shedding from your skin. Looks a bit like “chicken skin” when it flares. My personal solution (although there are others) is regular exfoliation and occasional dry brushing and a good blemish assisting body moisturizer. On the legs, it’s always been most difficult because of shaving. Ingrown hairs and razor burn because of the already sensitive skin cause further problems 🙁 Bought a Tria laser, expensive, but worth it. At 40 I no longer have the problem on my legs as I’ve eliminated at least one source of the irritation 🙂 Good luck! I have a question about the causes of milia. I’m paranoid to use anything near my eyes but I heard that olive oil is safe and does not cause milia. Would you be able to confirm this? 🙂 Also, is there any specific ingredient that I should be looking for in my moisturizers (to avoid) that may increase the chance of milia? I live in indonesiaI have milia around my eyes,is there any kind of fruits or plants could I use ? White spots on skin will affect persons of all skin colors and kinds. humid climate. These spots can differ inside size from tiny white dots to large white marks. 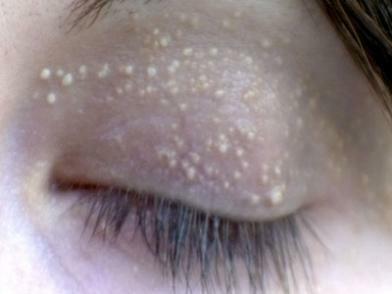 Some become brown spots covered by white scaly skin. Let us take a look at what causes white spots on the body. I have kidney disease. Can the millia come from that? : Illusia Prestigious Skincare @begorgeous.net. The product is called “Intimidate” because it takes on the milia and wins! I had little white bumps all over my cheeks. I changed my diet – no response. Tried squeezing, not much improvement. I was ex philistine, using very expensive skin products. Nothing worked. So I tried tooth paste. Colgate total all over my skin after washing. I left it on over night. Did this two nights in a row and practically all gone! Honestly worth a try. I had them for 3 months before I tried the toothpaste. i have milia on my upper lashline (right above my eyeball), do you have any advice of removal or causes? since it’s not really easily accessible, i think exfoliating and cleansing is out of the question. Hi, so does anyone know how much it would cost to have a dermatologist remove a few around my eyes? I used crushed Vitamin C . The skin will peel and eventually a hard waxy looking sebum plug will pop out. Usually scabs over and heals within a week.safe under eyes. Use a little neosporin around the skin if it gets irritated. Also toothpaste works. I have PCOS and mine started 2 years ago. hi, this has been brill, i just wanted to ask, as mine arent as severe as all the pics, but um sure they were caused my sun damage. would a series of microdermobrasions help? and hoe often would they need to be done? im tempted to get a chemical peel but a but afraid that it may be tooo harsh as my skin is super sensative. also i noticed you said a cleanser that target oily skin, my skin is very dry, would this still be the right way to go?? Increase water content in the body. Take light food in the evening. Work out and most important early morning suryanamaskar and yoga. Definitely, you will see the magic within two weeks.